HOW TO UPDATE SOFTWARE AND PRINT OUT DIAGNOSTIC REPORT? 【FULL OBDII FUNCTIONS】-- Full function professional Diagnostic Scan Tool for car owners. 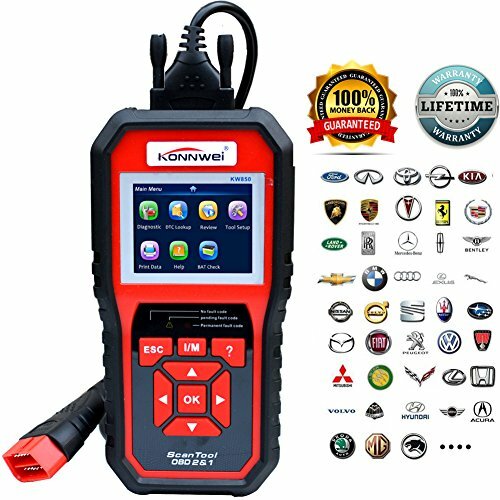 supports read and erase DTC(emission-related trouble codes); Turn-off Check Engine Light, Reset Monitors; I/M readiness key monitoring; Graphical and Numeric Live Data Stream; built-in Over 3500 Generic Codes definition look up library, etc. This obd2 Scanner can accurately determine causes of engine trouble. 【PROFESSIONAL SMART DIAGNOSTICS】-- This automotive scanner Can fast to scan vehicle's engine healthy status. exclusive O2 sensor test, EVAP test of fuel tank system(mode 8) and advanced on-board monitoring(Mode 6) make you full control of vehicle running status. Audio feedback and 3 LED indicators tells you the trouble codes status and allows you to diagnose vehicles faster and more convenient to operate. 【PERFECT PATENTED DESIGN 】-- Featuring the unique patented One-Click I/M Readiness Key, 2.8" TFT color display and built-in speaker, Do not need to install APP, you can read codes on the screen. Anti-shock and slip designed, unique dust-resistant surface, more durable and stronger. This OBD2 Scanner is truly the ultimate in power and affordability, allowing users to do their jobs faster. In addition, thousands of troubleshooter code tips help technicians to save diagnosis and repair time.